Sanzaar have announced the Referee Panel for 2019’s Super Rugby competition. Two of the 2018 squad have been left off the panel, with Japanese referee Shuhei Kubo and New Zealander Jamie Nutbrown off the panel for this season. There are two new appointments to the 15-man panel, with South African AJ Jacobs and Australian Damon Murphy the new faces, although Jacobs was provisionally announced as a squad member in 2018 he did not officiate in any games. Jacobs is one of five South Africans on the panel, including Jaco Peyper, Rasta Rasivhenge, Egon Seconds and Marius van der Westhuizen. New Zealand provide six of the referees, Nick Briant, Mike Fraser, Glen Jackson, Ben O’Keeffe, Brendon Pickerill, and Paul Williams. Australia provide Nic Berry, Angus Gardner, and newbie Damon Murphy. Federico Anselmi is the sole Argentinean on the panel. When required, due to logistical and operational requirements, Sanzaar will utilise match officials from outside the panel of 15 to allow for the development of local talent. 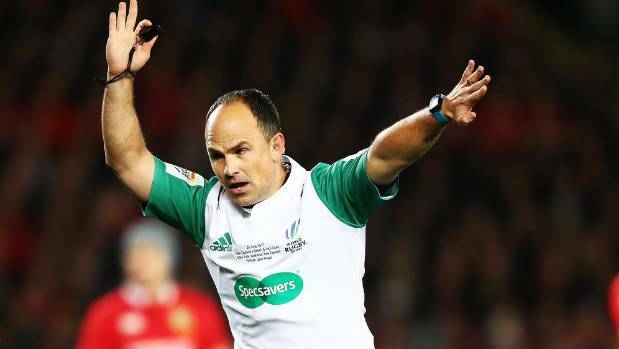 Jaco Peyper and Glen Jackson provide the most experience in the squad of 15, having refereed 95 and 77 matches respectively, there are also a number of referees with around 40 to 60 games, including Angus Gardner, Nick Briant, Ben O’Keeffe and Mike Fraser. In 2019 the 15 referees will be working closely together in five pods of three, with each pod refereeing together in as many of their games as is practical as on-field referee and assistant referees. This will hopefully help the efficiency of their teamwork, and contribute to increasing consistency amongst a bunch who have often seemed to be operating from completely different law books to each other.